Curtsy is doing well. WE have had no major problems at all, the charging system works well, our batteries, 6 of them, golfcart, are now 8 years old, but not showing any signs of wear. Bert fills them up every 3 weeks with distilled water, the two solar panels have outdone themselves this summer, but then we also had nothing but sun!! On average they bring in 16 amp. continuous. On the odd cloudy day we run the Honda 2000 gas generator, and then charge everything too, batteries for the cameras, computers, and i can vacuum, which sometimes is really, really necessary!! The wind generator has not been used, it seems to be out of balance , i think its the bearing, and now makes a terrible racket when turning. Next year a new one….. maybe……. We keep the water tanks full, usually , at anchor, we use only one tank, and fill that one with our portable tank, we use on average 12 to 15 gallons per day, for everything!! While at the dock, like right now, we use all three tanks.The water maker is only used once every week, or when truly necessary, it does need to run that often to keep it clean. So there you go, our home on the water, the last few mornings it has been cold, we sleep with lots of portholes open for fresh air, so when i get up i start the diesel stove, which brings the temp up within a half hour. We love this stove and find it the most important item on board. Curtsy is dry and warm, she is fully insulated, which is absolutely wonderful. If you see us out there sometimes, come and have a look!! This might become boring for some of you….. Because,yes!!! We are back in Pender harbour!!! It always feels like coming home when we enter her harbor, and someday we hope to make our home here. Our friends, Martha and Doug AGAIN let us tie to their dock, let me do my laundry, which is such a blessing, Martha is a boater, so she knows how much it means when you can do your laundry somewhere. We value their friendship very much so , and just wish we could do something in return,they have been and are a huge contribution to our summer being wonderful this year. I do repair work too, which keeps me busy. I think we will be here till next week, Balandra should be finished then, we still want to head to Desolation Sound for the month of September and meet up with friends there. 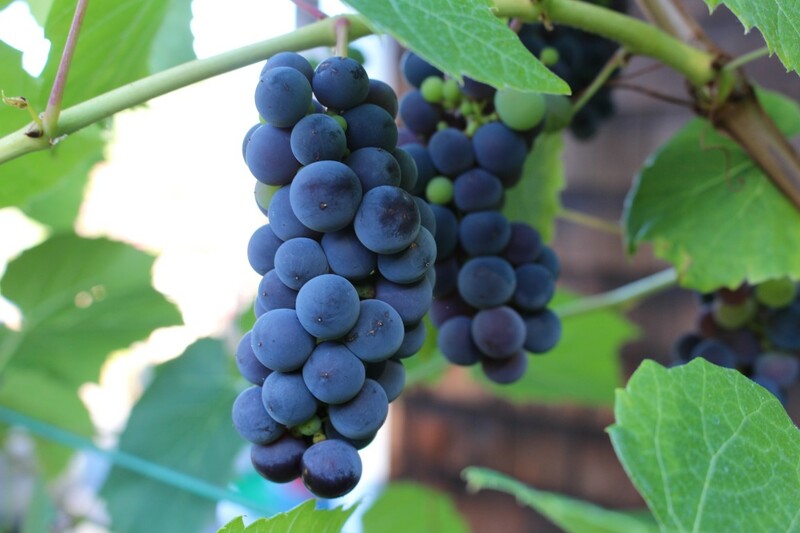 Grapes in Martha’s garden, aren’t they gorgeous???? 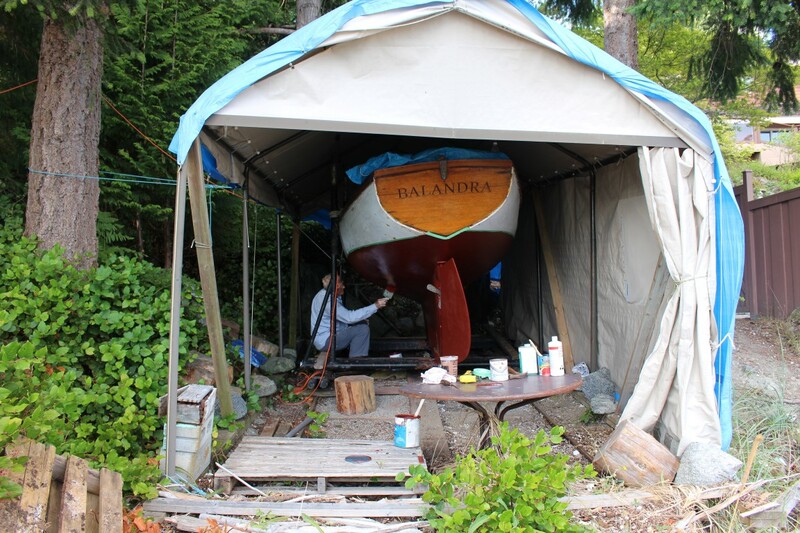 Balandra’s home, where my 6’4″ man is folding himself around the little sailboat. Her beautiful repaired rudder, freshly painted. The view from Balandra’s home. 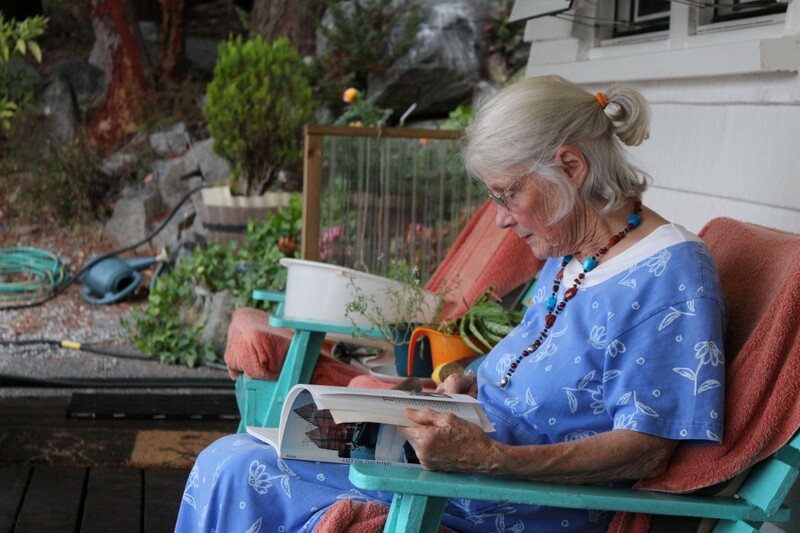 My dearest friend, enjoying a quiet moment in front of the cottage. 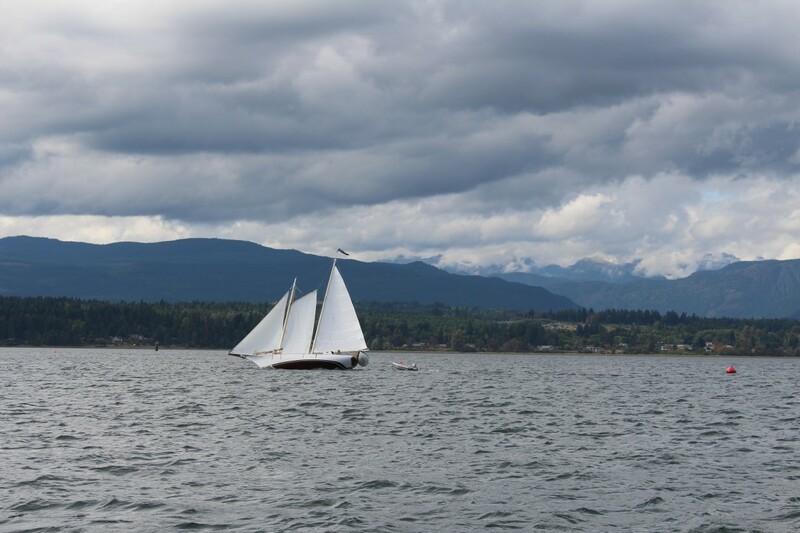 Some of the sailboats we meet out there…. This is SV Oriole, belonging to the Navy. They take cadets from HMCS Quadra on board. Beautiful schooner, dont know her name, she was heeling 30%, just no way i would have been on board!!! 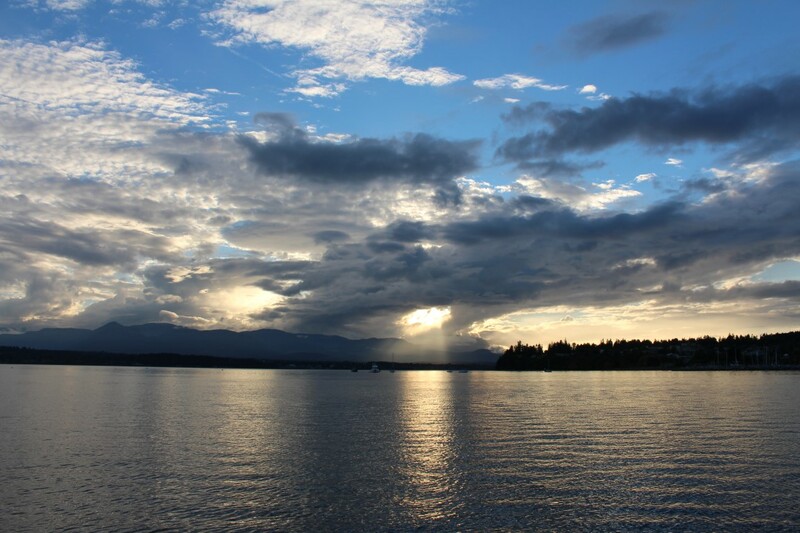 Cannot pass up this beautiful Comox evening sky. 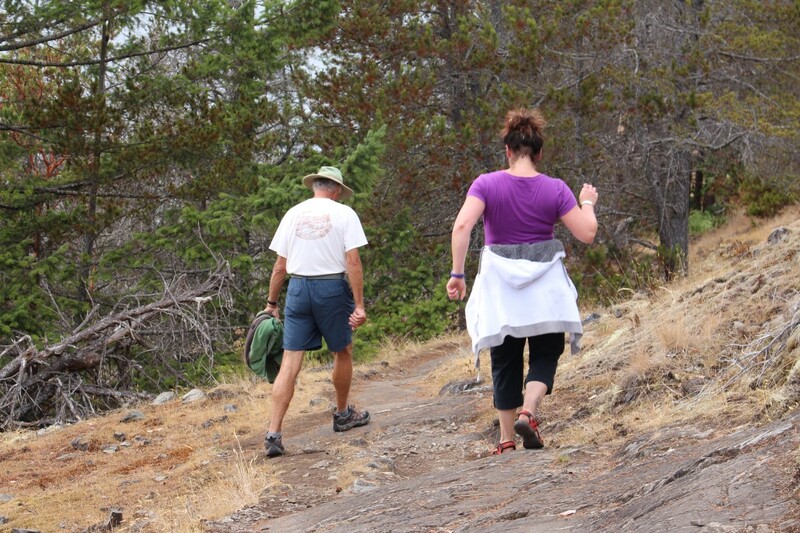 leaving Comox, back to Pender Harbour, if this were a road, we would have left tracks by now!!! 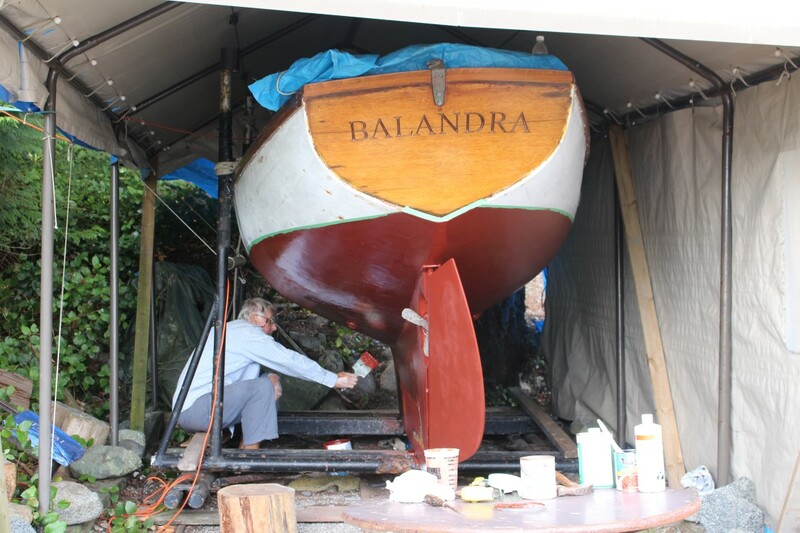 Its been a truly good summer though, we are never in a hurry, go here, go there, if the weather is good, one of the most important things is to get Balandra ready, i am not sure if she goes into the water this summer still, but she will be ready for sure. She is safe in her “house”, and she will be ready for sure next spring to go to a new owner. 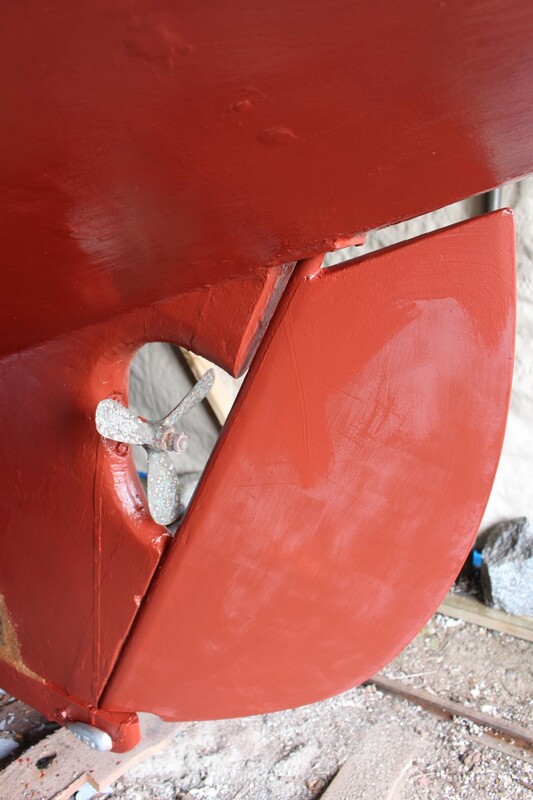 Bert has been working on the bottom paint, which is now all done, the next thing is to ready the hull for a new coat of paint. 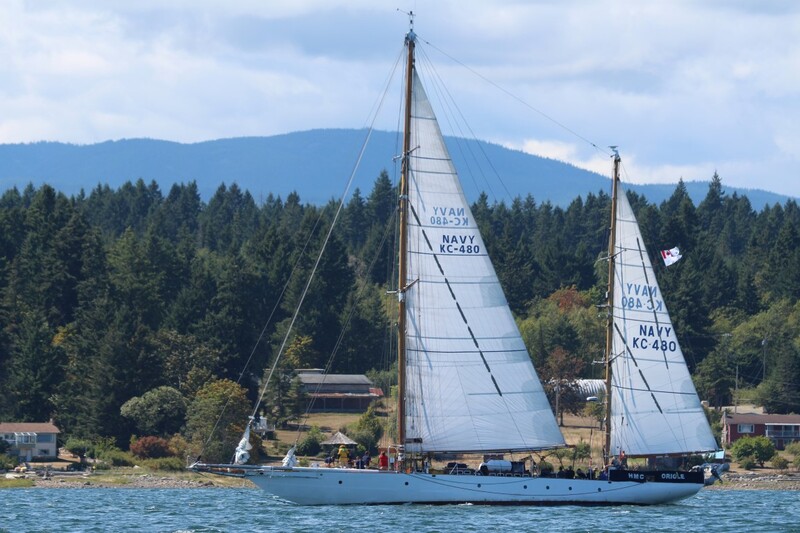 On August 19th we sailed from Comox to Boho Bay, the wind was NW, around 10 knots, but the forecast called for a strong wind warning, also NW. We sailed into Sabine channel and slowly the wind came up more and more, by the time we sailed between Lasqueti Island and Jervis island,it was blowing close to 20 knots, i had hoped to anchor again in Little Bull Passage, but Bert did not feel good about it this time, so we headed to Boho bay, supposedly a good place to be with a NW wind. 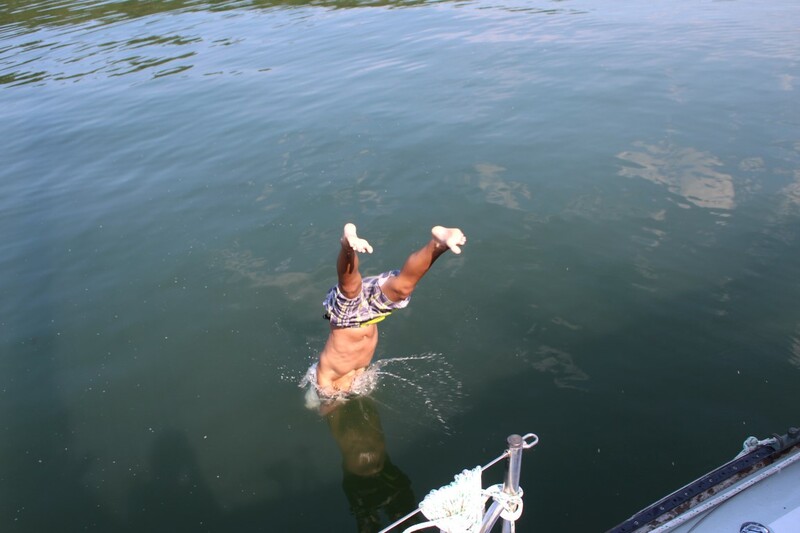 Long story short, all was well, all still well the next morning, even though i didn’t sleep, First mate’s job is a tough one at times…. Two more boats came and anchored near us, the wind did not let up and we had a NW all day, and again all night. Its a beautiful spot, across the bay ,a huge rock wall rises out of the water, it all depended on how the sun would hit the rocks, every moment was different, people is their dinghy motored by and hollered into the rocks, listening to the magnificent echo!! Bert went fishing the next morning, he was just dying to try to catch something. He didnt go far, just to the base of the giant rock wall, i was not watching so when he came back an hour later i figured he had not had any luck….. well, he said, look into the bucket!! yeah!!! right!! you didnt catch a thing heh??? 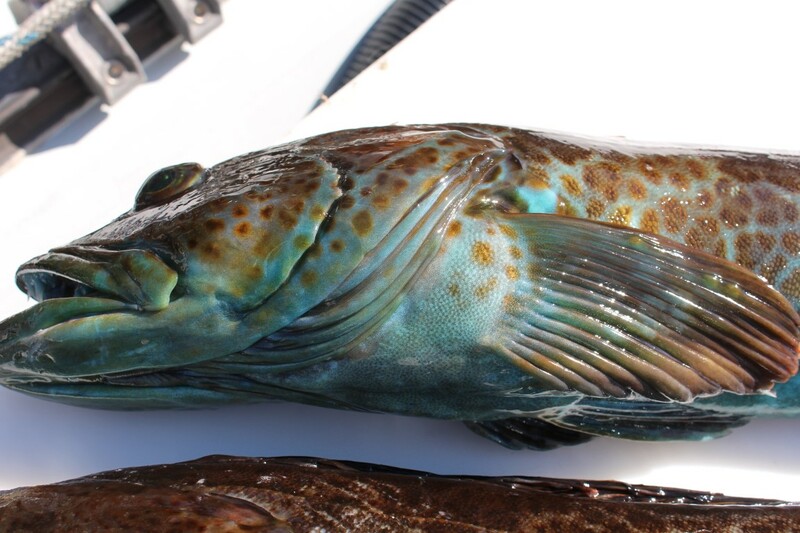 But here, in the bucket, totally filling it, were three Ling cod, one more beautiful then the other, all of them over 26″ long!! One of them was a gorgeous turquoise color with gold specks, even its eyes were turquoise , i thanked all three for giving us some very good food!! 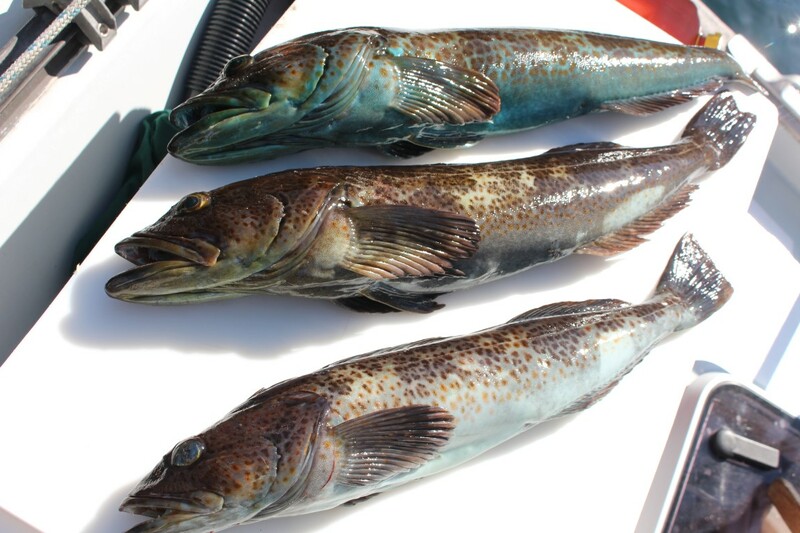 Three Ling cod, what a gift!! 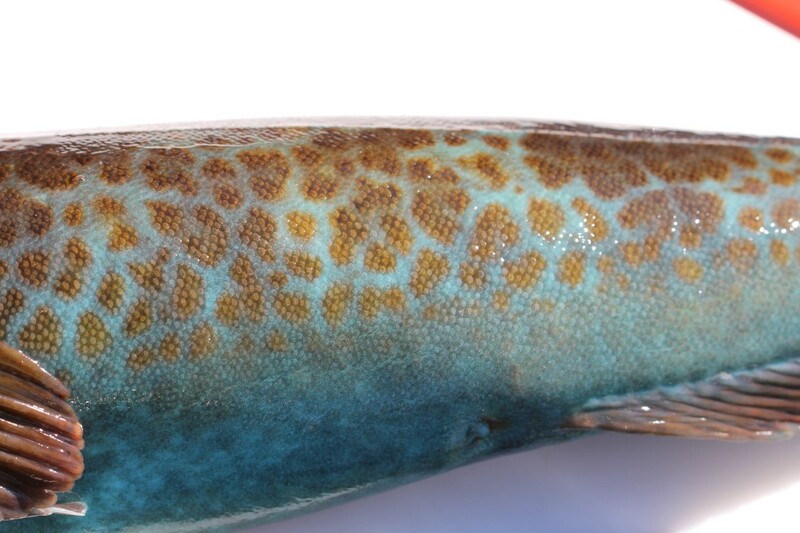 The meat of this fish was a soft turquoise color too, turning snow white as i cooked it. Family get together in Dove creek. We were hoping to still have a dinner together with Tess, time was running out, unbelievable ,how fast 6 weeks go, the plan was to go to the beach, but weather wise that didnt seem like a good idea , they kept talking about rain, so it was decided that we would all go to Karen and Trev’s house, truly a beautiful spot , always good to be there. We had a super time, Bert and i brought two large fillets of wild sockeye, Tess made a super nice salad, and Karen took care of everything else, she is a super good cook!! she made an incredible peach pie, yes, with whipping cream, Bert definitely was in heaven!!! he should be after two pieces!!!! 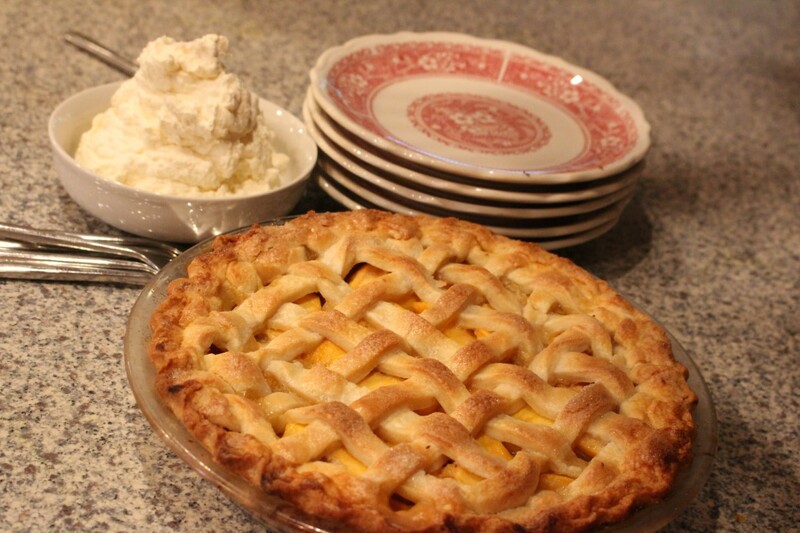 peach pie with whipping cream, you just cant go wrong!!!!! 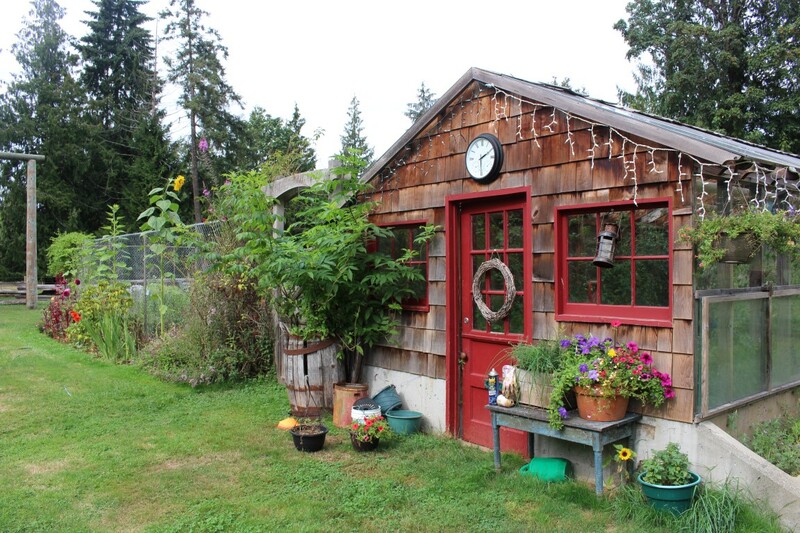 Back again to Comox,August 3rd. 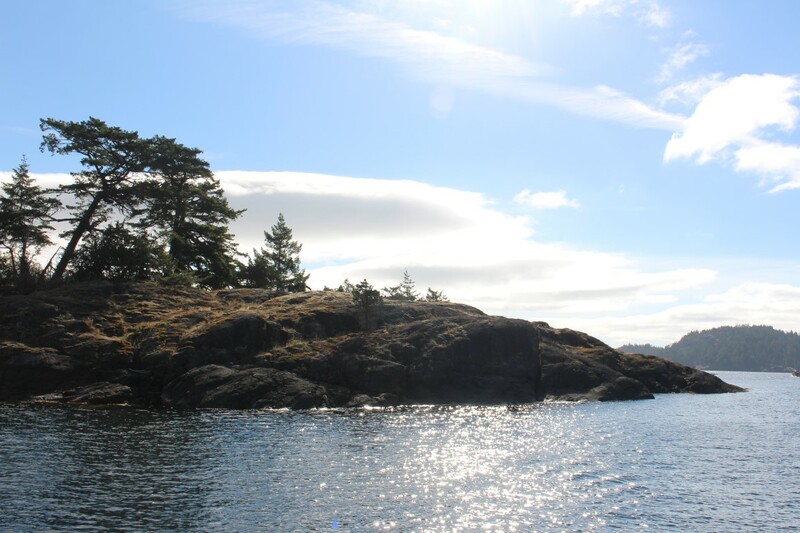 I am starting to get used to this route between Comox and Pender Harbour, the main thing we watch out for is the tide and wind, so nice if both of them are in our favor!!! 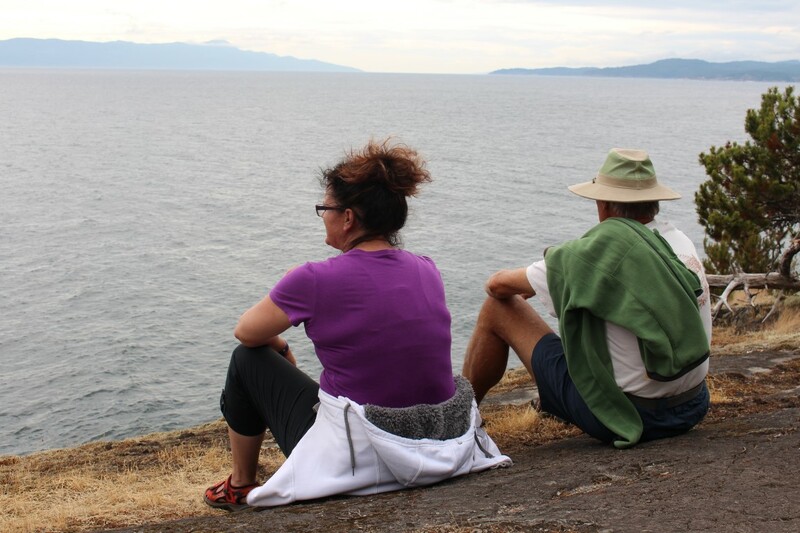 Its a long day too, this time we went through Baynes Sound, past Hornby island , past Chrome island, Baynes Sound runs in between Denman Island and Vancouver Island. We still had the tide with us, but we had to motor , no wind!! 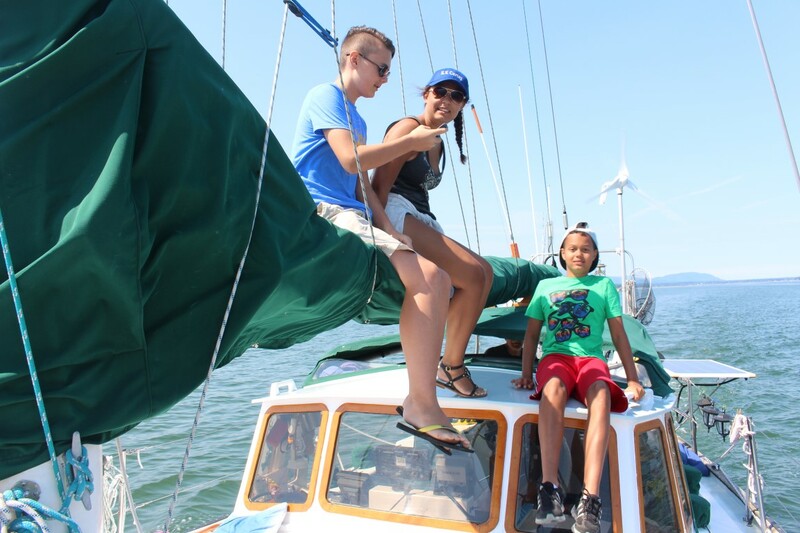 Every time arriving in Comox harbour is a challenge, as there are boats every where, lots of boats tied to buoys, some boats anchored, but its the little sailboats with cadets and kids practicing that provide a challenge. 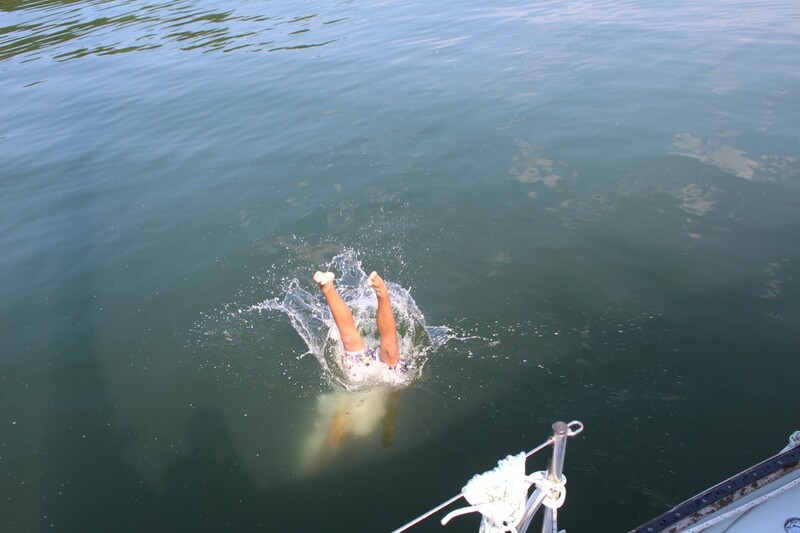 This time coming in, a girl sailing one of the little boats , headed straight for us, not noticing us at all!!! We managed to avoid a collision in the nick of time! Our spot, or rather our favorite spot was free, we like to anchor in front of the breakwater, in line with the Government buildings, its excellent holding, and the view is magnificent!!! We knew we were going to be busy, Tess was going to come back on board, together with her friend Kathy, Charlie our grandson was joining us, Petra ,Kevin,Duncan and Malcom came for a visit, even though it was on a rainy, blustery day, and Sandra came with us for the day, together with Mieka,Ty and Maya and malcom. We had such a good day with them, the kids were awesome on board, they respected everything, had tons of fun!! 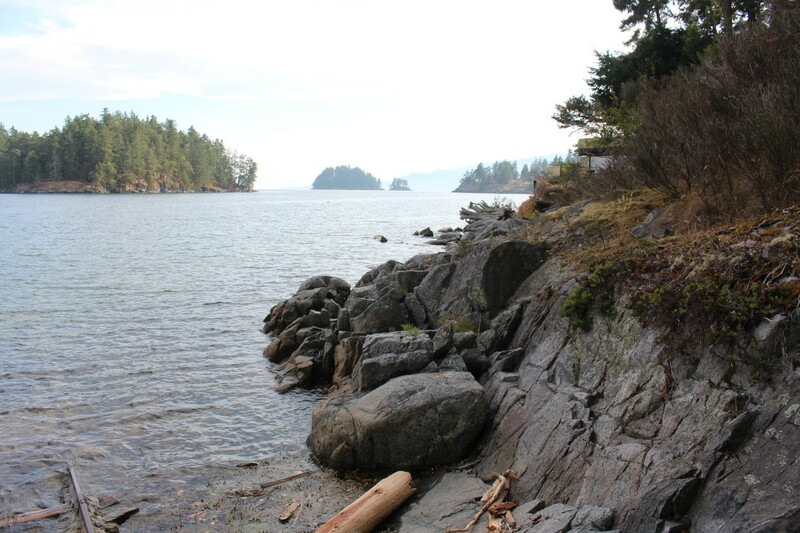 We took them to Hardy bay, at Denman Island, Hardy bay is alongside a Spit, a long sand beach, wonderful for exploring and swimming! It was such a hot day , again, so they all ended up in the water. 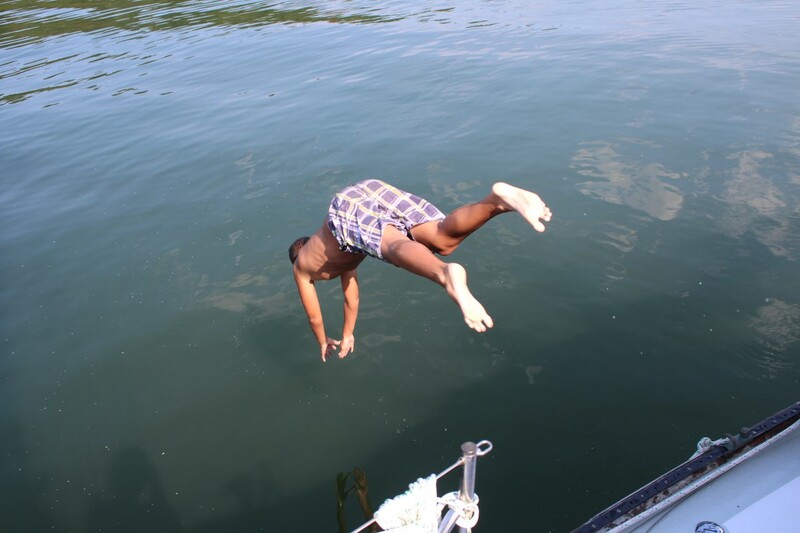 Coming back from the beach , we first ate all the goodies available, and then Bert opened up the lifelines so that Ty , Malcom and Maya could jump off the boat,actually, Ty is a diver, what an awesome job he does, i took some fun photos of him and need to show them off!!! 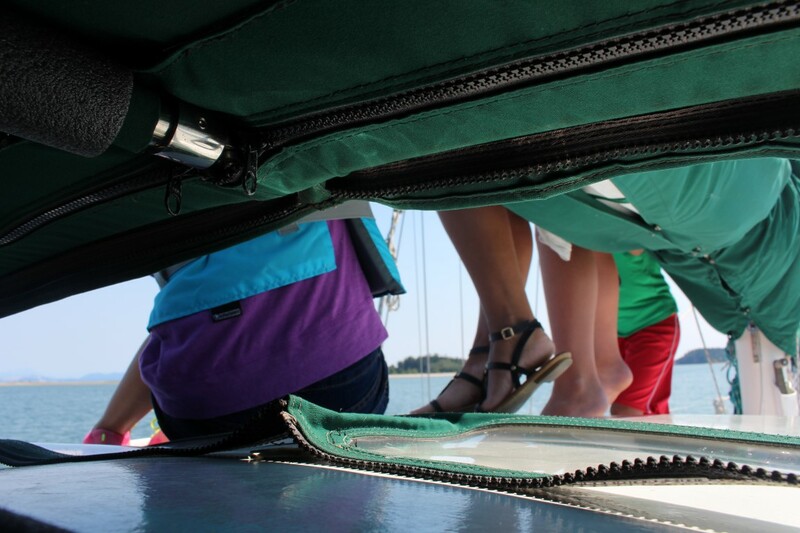 Definitely some grandkids on board…. Its been so immensely dry here this summer, that most of the trees and bushes started changing color much sooner then normal. 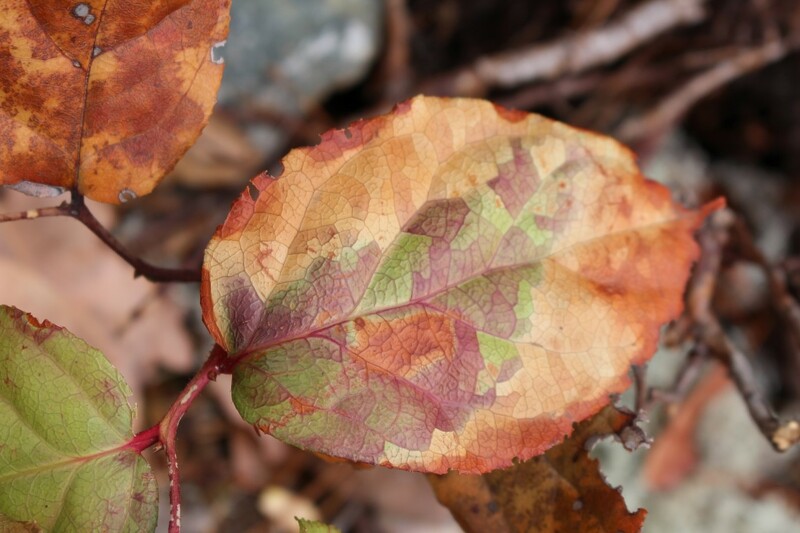 This Salal bush is already dying off. 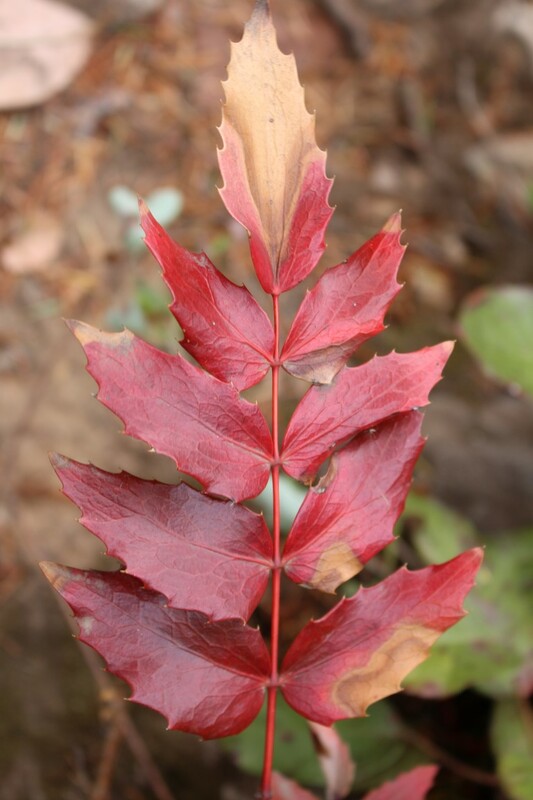 Oregon grape, turning a beautiful deep red. Tess and Bert enjoying the walk. Just have to stop and take in the view.